Is This Dog Right for You? The Cavalier King Charles Spaniel is a very active, playful breed. They get along great with children, cats, and other dogs and are easy to train which makes them a great house pet. 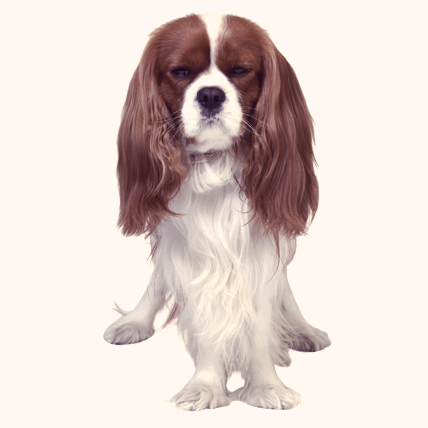 Cavalier King Charles Spaniels are known for their bravery, athletic spirit, and affectionate personality. The Cavalier King Charles Spaniel, named for King Charles II, came about as the result of a lot of crossbreeding. First, King Charles crossbred his Spaniels with a Pug dog, which is how we ended up with the King Charles Spaniel. Then a man named Roswell Eldridge offered a reward to anyone with a King Charles Spaniel that exhibited the same features as King Charles’ Spaniels before the Pug was bred in. The dog he found became the ancestor of the dogs we consider to be a Cavalier. By 1996, the AKC began to recognize the Cavalier as a breed in their own right. The Cavalier King Charles Spaniel has a long face with a flat skull and a small and tiny depression in the center. This majestic dog has a coat perfectly patterned in four different colors; red and white, tricolor, ruby, black and tan, and possesses big, round, dark brown eyes and long, silky hair on their ears, tails, bellies, and legs. The average weight of Cavalier King Charles Spaniel ranges between 13 and 18 pounds. A combination of rare virtues, the Cavalier King Charles Spaniel is a highly active, lovable, playful, and intelligent dog, renowned for their elegance and brave, sporty spirit. The Cavalier King Charles Spaniel, with their gentle, affectionate and commanding nature, is devoted to their owner and is extremely friendly with children, cats, and other dogs. Moderately active indoors, they are quite easy to train. Red and white (Blenheim), black and tan (King Charles) tricolor (Prince Charles) and solid, dark red (Ruby).